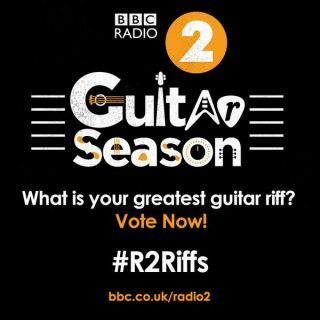 BBC Radio 2 is on a mission to decide the best guitar riffs of all time. Selected by a panel of music industry types including Radio 2 and 6 Music DJs, journalists and producers the shortlist features 100 classic riffs from some expected legends (Led Zeppelin, AC/DC, Black Sabbath), some modern classics (Daft Punk, Queens Of The Stone Age, Rage Against The Machine) and some perhaps unexpected entries (Arctic Monkeys, Edwyn Collins, Radiohead). To see the complete list, and to vote in the poll click here. Voting is open until 5pm on Friday 25 July, and the results will be announced on 25 August (Bank Holiday Monday) on Radio 2.